In a heartwarming symbolic gesture, Australia have included seven-year-old Archie Schiller in their squad for the upcoming Boxing Day Test against India. The young leg-spinner has received the opportunity to rub shoulders with the best cricketers in the country through the Make-A-Wish Foundation. Archie has been named co-captain and will lead the Australian players as they step on to the field at the iconic Melbourne Cricket Ground. 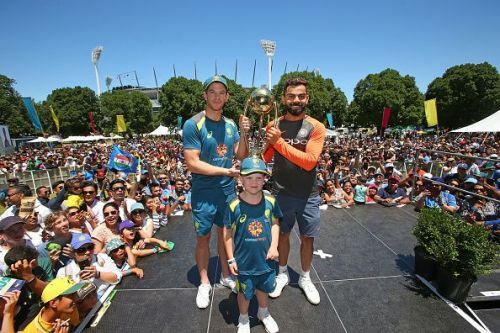 The budding cricketer, who turned seven on Saturday, shared the dais with Tim Paine and Virat Kohli during a cultural festival at the Yarra Park earlier today. When Australia were in UAE for a series against Pakistan, young Archie had received the news regarding his inclusion in the Test squad from head coach Justin Langer. Archie also trained with the Australian players on the eve of the opening Test against India at Adelaide. The gifted boy, who wants to don the Baggy Green one day, has had to battle plenty of adversities for someone of such a tender age. As a three-month-old baby, Archie underwent a major surgery lasting for seven hours for a major heart condition. Just six months later, he had to go through the pain of another surgery on his barely beating heart. During December 2017, Archie's family returned to Melbourne for a third open-heart surgery on the young boy. Showing enormous resilience, he managed to pull through the complicated procedure. Australian skipper Tim Paine gushed, "When his dad asked him what he wanted to do, he (Archie) said ‘I want to captain Australia’. I think it’s been picked up along the way and we’re rapt to have someone like that around. He adds a bit of perspective I think." The wicket-keeper captain added, “Sometimes we live a life, it’s very good, but you can be consumed in your own life at times, so to have someone like that around is actually really inspiring for our group. It’s great to have him around and we look forward to his debut on Boxing Day." The third Test between Australia and India is set to begin on December 26 at the MCG. With the series locked at 1-1, another pulsating encounter is on the offing. Meanwhile, for young Archie, it will be a moment to cherish for a lifetime when he leads the Australian players on to the field for the start of play.